36' Chris Craft Constellation power boat | Christian & Co. 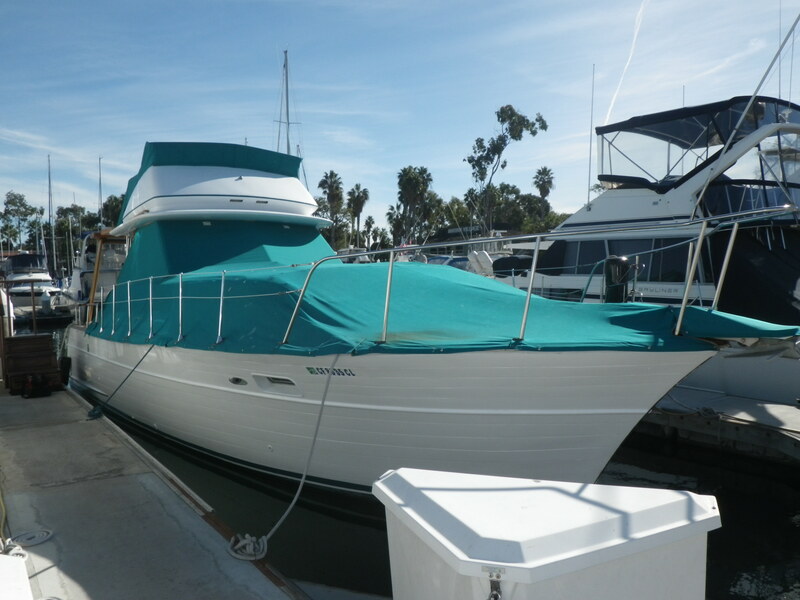 This inspection was performed upon the request of the client listed above on November 24, 2014 while the vessel was hauled at Driscoll Mission Bay,1500 Quivira Way, San Diego, California and while afloat on F-dock, Marina Village Marina, San Diego, California and the current owner attended. Layout/interior components: Flybridge motor vessel, aft deck, ladder to starboard between aft deck and flybridge, flybridge has helm forward, aft deck has helm to port forward, engines below aft deck with deck hatch access, center companionway to cabin, cabin has dinette to port, galley to starboard, head to port forward, bench to starboard forward and cabin forward with berth. Comments: The vessel was inspected while hauled and afloat. The hull bottom was visually inspected and randomly sounded. The hull bottom is in satisfactory structural condition. The current owner stated that the anti-fouling paint was applied in the recent past. It exhibits satisfactory – good coverage. There is minor localized anti-fouling paint failure. There is no zinc plate on the transom. The port forward garboard plank is “bulging” near the forward straps. This is a different appearance from one side to the other. The current owner reported that fasteners were pulled during a survey on the vessel performed earlier in the year. We did not pull fasteners for this inspection. There is wood damage on the transom about the swim platform brackets. The hull sides and transom were visually inspected and randomly sounded. The hull sides and transom are in satisfactory structural and cosmetic condition. There are areas of soft wood on both sides of the hull forward of amidships, throughout several planks below the upper rub rail. There is minor damage at the edges of the transom. The deck and superstructure were visually inspected and randomly sounded. The deck and superstructure are in satisfactory structural and cosmetic condition. There is a deteriorated deck support to starboard outboard of the fuel tank. There is deteriorated wood near the edges and corners of the hardtop. There are soft reports when tapping the deck on the port side between the second and third from aft stanchions. There is a soft spot on the side deck just forward of the cockpit on the port side. The deck hardware including safety rails, mooring devices and hatches was visually inspected and most hatches and the port lights were opened and closed. Overall the deck hardware is in satisfactory condition. There are no wood steps on the ladder to the bridge. The flybridge access opening is small. The starboard forward window is “cloudy”. The port cockpit safety rail is loose. Many of the lifelines’ stanchions flex at their bases. The port side port light is cracked. The foredeck hatch is missing some hardware, including set screws. The structural reinforcements including the stringers and bulkheads were visually inspected and randomly sounded. The structural reinforcements appear to be in “as-built” condition. There are a few cracked frames. The cracked frames are at the junction between the hull bottom and the hull sides. These frames are generally built with one two piece knee and one solid knee; the cracks are in the solid knee. There are cracked frames outboard of both transmissions and outboard of the water heater. There are soft frames at the chines on both sides forward in the engine room. There is soft wood and crystalline deposits about the rudder ports. There is water in the bilge in several places including near the water heater, above the chine to port aft and aft of the engines (more to port). Some of the forward frames are soft at their ends near the keel. There is minor soft wood about the propeller shaft alleyways. There is termite kick out in several locations including in the port aft bilge, on top of the port fuel tank and below the aft bench seat. The bilge is holding moderate water; the origin is beyond the scope of this survey. The interior cabin spaces are neat, clean and orderly. The interior of the vessel is in satisfactory – good cosmetic condition. This survey is not a mould inspection. Comments: The engines and transmissions were visually inspected and tested during a sea trial. The client had the engines and transmissions inspected by a mechanic, please refer to the mechanical survey report for greater detail as to the condition of the machine systems. The external surfaces and peripheral components of the engines and transmissions appear satisfactory. The flybridge engine starts are inoperative. There are no audible engine alarms. The engine controls functioned normally. The exhaust system is properly arranged and installed. There are rust stains weeping from junctions in the engines’ exhaust components (manifolds and risers). The tachometers “bounced”. The propulsion components including the propellers, propeller shafts, struts and shaft seals were visually inspected. The propellers were percussion tested and spun with a fixed object adjacent to the blades. The propeller shafts were manipulated in the struts and observed while underway. Overall the propulsion components are in satisfactory condition. The struts exhibit corrosion (pink and ductile). The propellers are somewhat “dull” when percussion tested. The steering system was visually inspected and test operated. The steering system functioned normally. There are crystalline deposits about the rudder ports. The engine room blowers were energized. The starboard engine room blower is weak and remains energized. The through hulls were visually inspected and the valves were manipulated. The through hulls are in satisfactory condition. The seawater systems were visually inspected and most components were tested. Overall, the seawater systems are satisfactory. The electric bilge pumps were energized with their float switches. Comments: The fuel system including the tanks, fill, vent and feed lines was visually inspected as installed. Where visible the fuel system components are in satisfactory condition. The fuel hoses are braided, they are not labeled per U.S. convention. .The condition and age of the fuel (and water) and the integrity of the tanks (fuel, water, holding) and hoses is beyond the scope of this survey. Please consider filling all tanks for a simple, practical test of their integrity. The water pressure system functioned normally. There is a leak below the galley sink. The shower is not plumbed. The accuracy of tank level gauges is beyond the scope of this survey. Comments: The electrical system including the shore power cord, shore power inlet, batteries, wiring, circuitry components and circuit protection equipment was visually inspected and most components were tested. Overall the electrical system is in satisfactory condition. The condition and age of the batteries is beyond the scope of this inspection. The water heater is not secure and was not tested. There is an unused battery in a plastic box at the bilge, it is not secure. There are wing nuts in use on the batteries and the batteries are not well secured. There is a wire to starboard forward in the engine room which feels like solid strand wire. There are three rocker switches below the flybridge steering wheel which serves an unknown purpose. The trim tabs are not functional and are reportedly not connected. The Frostman refrigerator is “iced over”. Comments: Safety equipment for firefighting protection appears satisfactory however the extinguishers have not been inspected, tagged and maintained per N.F.P.A. recommendations. The current owner reports that a fixed Halon extinguisher is aboard the vessel, it has not been installed. Personal flotation devices appear suitable for near coastal use. Current distress signal flares are aboard. A suitable sound signaling device is aboard. The navigational lights are properly arranged, installed and functional. We did not see an all around / anchor light. The lower compass is askew, reportedly due to the proximity to the VHF radio. The ground tackle including the anchor and rode was visually inspected as installed and appears satisfactory. The entire length of the anchor rode was not inspected and should be inspected prior to use. There is no secondary anchor or rode. There is an LP stove aboard though there is no propane aboard. The vessel is a wooden flybridge motor vessel equipped with two gasoline engines. The current owner purchased the vessel in 2014. The vessel was inspected while hauled and afloat. The vessel was operated from the slip to the boat yard, but no sea trial was performed. The engines were not loaded. The current owner reports that a water pump on one of the engines and an impeller on the other engine were replaced. The client had a mechanical survey and a sea trial was performed with his cousin, Mr. Ken Cohn aboard. The vessel is basically structurally sound. Upon completion of the recommendations the vessel should be suitable for its intended purpose as a coastal cruising vessel. Maintain the portable fire extinguishers per N.F.P.A. recommendations. We strongly encourage the installation of the fixed fire suppression system which is reportedly aboard. Assure it is currently certified and of sufficient size for its intended service area. Provide and install an all around / anchor light. Comply with U.S. and international regulations. Modify the installation of the lower helm compass with the HF radio so that the compass functions normally. If propane is to be brought aboard and used (the galley stove is a propane device), comply with N.F.P.A. and A.B.Y.C. recommendations. Provide a secondary anchor and rode for use in two anchor situations or emergencies. Repair the freshwater leak below the galley sink. Reconnect and prove the shower functional. Address the cracked frames in several locations including outboard of the water heater and outboard of both transmissions. Determine the source of the water in the bilge in various locations including to starboard aft by the water heater, to port aft above the chine, aft of both engines (more significantly to port). Eliminate any leaks. Remove water to allow detection of any future weeps or leaks. Repair the deteriorated deck support, outboard of the starboard fuel tank. Service as a result of soft and deteriorating wood about the rudder ports. Exterminate termites (or similar insects). Eliminate “kick out” to allow detection of any future infestations. Termite kick out was found in the port aft bilge, on top of the port fuel tank and below the aft bench seat. Repair the soft wood on both hull sides forward of amidships, below the rub rail. Eliminate any cause of this deterioration. Determine the significance of the bulge at the port garboard plank near the forward lifting straps and address appropriately. Address the wood damage about the swim platform brackets. Address the apparent soft wood (soft audible reports) on the deck between the second and third from aft stanchions and just forward of the cockpit on the port side. Properly secure all safety rails including the port cockpit safety rail and the lifeline stanchions as necessary. Service as a result of the rust stains weeping from the engines’ exhaust components. The struts (more significantly to starboard) are pink and ductile, determine the extent of the deterioration and service / replace as necessary. Provide audible engine alarms and prove them functional. Properly secure the water heater. Remove the unused battery from the aft bilge. Replace wing nuts used at battery terminals with steel nuts and lock washers. Comply with A.B.Y.C. recommendations. Properly secure all batteries, comply with A.B.Y.C. recommendations. Review of the fastener condition report on the prior survey suggests fasteners are in marginal condition overall, address as necessary. Monitor the soft frame ends near the chines forward on both sides of the engine room and repair as necessary. Monitor the soft wood about the propeller shaft alleyways and repair as necessary. Monitor the soft frame ends in the forward bilge spaces and repair as necessary. Repair the minor damage to the transom edges as necessary. Provide wood steps for the ladder to the flybridge. Exercise caution when transiting the flybridge ladder as this space is small. Address the soft wood on the hardtop, soft spots were found near the edges and corners (particularly on the bottom). We did not determine the extent and continuity of the bonding system, there is no transom zinc anode. Service this system and add a zinc anode as desired or necessary. The starboard forward window is cloudy, replace as necessary or as desired. Replace the cracked port light to port in the cabin. Provide all the hardware necessary to keep the foredeck hatch open, set screws are missing. There is localized bottom paint failure, address appropriately. Remove the crystalline deposits about the rudder ports, service to eliminate the condition causing crystalline deposits. Replace and prove the starboard engine room blower properly functional. Determine why the tachometers “bounce” and address appropriately. Service and prove the flybridge engine starts properly functional. Monitor any solid strand wire aboard and replace if/as necessary. Determine the functions of the various switches including the push / pull toggles and rocker switches on the flybridge and label them appropriately. Service and prove the trim tabs functional as desired. Address the iced over condition of the Frostman refrigerator. Assure that the fuel hoses are proper type hoses as they are braided and not marked per U.S. convention. Determine the condition of the propeller and repair or replace as needed. They were somewhat “dull” when percussion tested. The following components were not tested or inspected: all carpet was not lifted, Floscan unit, knotmeter, VHF, no sea trial was taken, TV / telephone outlet, windlass (button was pushed, no movement).